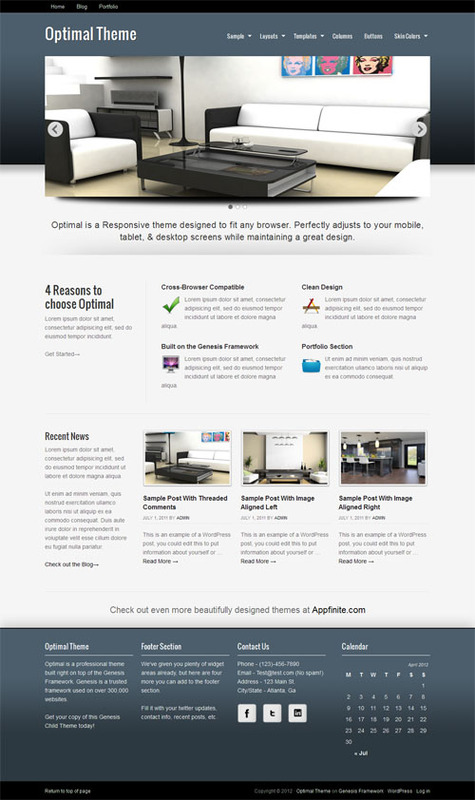 Optimal is a premium WordPress child theme for the Genesis Framework. The business style theme is available in the StudioPress Marketplace. Features include 10 colour styles, 6 layout options, custom backgrounds, boxes, buttons, menus, a mobile responsive design, theme options panel and more. Genesis is a highly optimized, flexible and secure WordPress theme framework with extensive layout, design and SEO options. Genesis makes it easy to customise and manage your site with features such as 6 mix-and-match layout options for individual pages or posts, numerous custom widgets, automatic framework update option, comprehensive theme settings panel and more. StudioPress is one of the leaders of Commercial WordPress Theme Development. Our team of professional Developers, Designers, and Support Moderators provide you with Themes and Support using the latest capabilities of WordPress, the leading CMS platform for the blogosphere.